Viva Belarus! / Жыве Беларусь! / Żywie Biełaruś! Viva Belarus! (Жыве Беларусь! in Belarusian; Żywie Biełaruś! 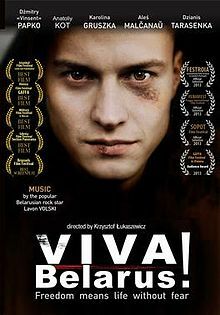 in Polish) is a 2012 Polish documentary about Belarus, based on true events. It was directed by the Polish director Krzysztof Łukaszewicz and produced in Poland, but its actors are all Belarusian and the main language of the film is Belarusian. The film tells the story of Miron Zakharko, who is closely based on real-life Belarusian opposition figure Franak Vyachorka (Францішак Вячорка). It begins in Miron’s youth, when he is a member of a popular band and has no interest in politics. After his band draws the attention of the authorities because of one slightly political song, he is forcibly conscripted into the Belarusian army and soon becomes a hero of the burgeoning opposition movement. Toward the end of the film, he is an active opponent of Lukashenka’s, even running for office. The real Vyachorka’s life followed a similar path (though he was less involved in music); today he is a journalist for Radio Free Liberty’s Belarus service. He’s been arrested a number of times, though not since 2011. Unsurprisingly, the film was extremely controversial politically. The main actor, Anatoliy Kot ((Анатоль Кот), had his contract with state film agency BelarusFilm terminated as a result of his appearing in the film, and another actor, Zmitser “Vinsent” Papko (Зміцер “Vinsent” Папко), has been persecuted by Belarus’s secret service. The Belarusian embassy in Poland criticized the film, accusing it of being a complete fantasy and of trying to stir up tensions between Poland and Belarus. For all that, the film as a film is a fantastic introduction to Belarusian opposition politics and to contemporary Belarus in general, from a political perspective. It’s also compelling and well-made, and well worth watching.